Concert and big-event producer Live Nation Entertainment has rebuilt its LiveNation.com site, and Chevrolet has gotten on board as a major sponsor. The site is focused almost entirely on fan content culled from social channels, using geo-fencing to tie fan tweets, comments, photos and videos to concerts as they happen. 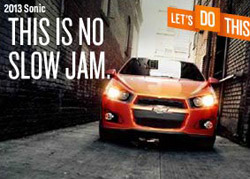 The Chevy Sonic subcompact is the focus, and Gen Y music fans are the audience. Russell Wallach, president of Live Nation Network, tells Marketing Daily that Live Nation is culling and curating fan blasts from sites like YouTube, Twitter, and Facebook and pinning this to the venues, events, and bands. "When they are at that show, fans have their smartphones out and are taking pictures and sharing. Our data says over 75% of attendees take photos or capture videos on their phones at events, and almost 60% actually post it online. What we have done is build a designation for live music fans to create a community fueled by social media." He says the deal allows brands to create their own programming on the site and activate on the ground at concerts. Chevrolet, for instance, will have a presence at the Dec. 13 Live Nation kickoff concert in LA, per Matt Scarlett, Chevrolet's national advertising & sales promotion manager. "We will cross-promote the event by doing things like having vehicles on display, including a 'flying Sonic' [a helium-filled replica] and we will demo some of the things you can now get through [telematics platform] MyLink." Scarlett tells Marketing Daily that the deal gives Chevy access to guaranteed site traffic, since the company acquired TicketMaster two years ago, making it a major ticket-buying hub. In addition to advertising, the automaker has on the site its own content such as pre-roll videos in which featured bands interact with the Sonic and its variants. "It's a 360-degree approach with Web site integration, concerts and videos," he says. A Live Nation statement says the platform also gives marketers location-based data on social and consumption habits and preferences of music fans via in-house data companies Big Champagne and Live Analytics. "Music has been consistent with Sonic launch," says Scarlett, adding that Chevy did a limited activation this year with Live Nation. One of the Sonic launch ads featured the band OK Go using a Sonic to “play” a thousand instruments arrayed along the car’s route. The company will have a presence at SXSW, and is looking at 2013 tentpole events like the MTV Movie Awards. Chevy has also done wild stunts with Sonic. A new Nielsen study would support that tactic: it shows that younger consumers respond to extreme sports and aspirational ads. Thus, Chevrolet snagged a last-minute deal giving it sole sponsorship of the Red Bull Stratus jump -- garnering in the process a huge audience for Chevy’s own skydiving ad, in which the car itself free-falls from a plane. Scarlett says since a lot of these deals happen fast, it’s about snap decisions and gut instinct. "We were approached with an opportunity to sponsor the Red Bull event two days before." Says Scarlett, "sometimes, you just have to jump."